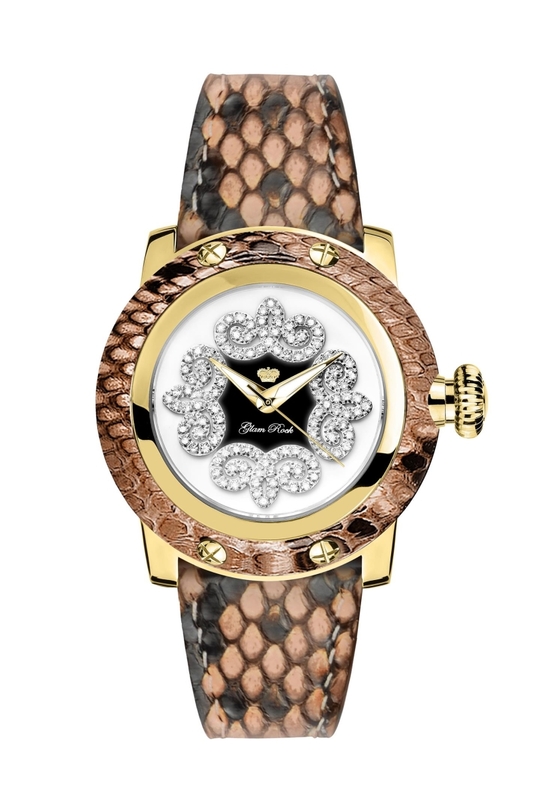 Designers Enrico Margaritelli and Isabelle Maujean wanted to create a line of luxury watches that were not only sophisticated but also a fashionable addition to any outfit. Known for its innovative style and vital energy, Miami’s cosmopolitan lifestyle provided the perfect inspiration for the two watch designers to apply their Italian aesthetic and industry expertise to realize Glam Rock. 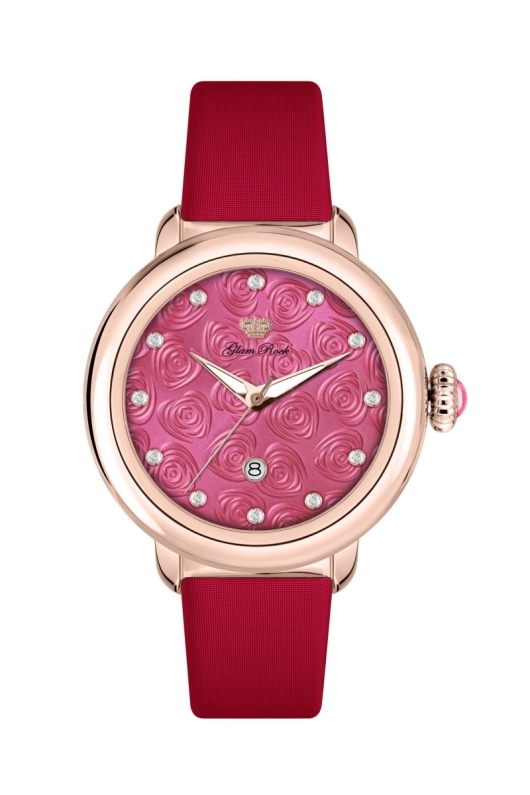 The name of the watches tells it all: glamorous, chic and eternally du jour, Glam Rock brings watches alive through color, advanced styling and high craftsmanship—all at an affordable price. 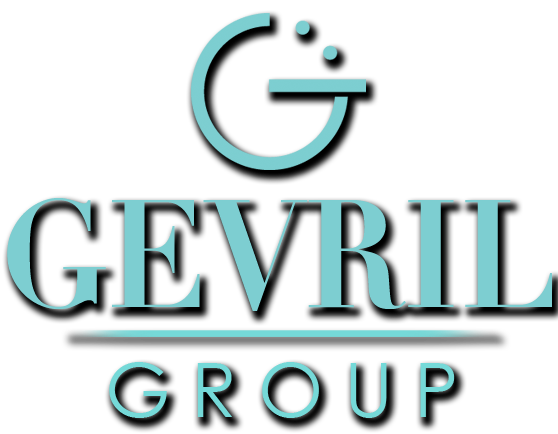 The company’s philosophy is that everyone deserves to indulge in luxury and that means a worldwide clientele that spans all continents around the globe. Glam Rock understands that there are many ways to aesthetically express personality and attitude. That’s why each collection offers various and distinct designs and they are always evolving. Glam Rock watches are constructed from stainless steel, which easily slip into the special Glam Rock case which utilizes a release system to allow interchangeability of straps. Only real skins such as alligator, leather and python are chosen for the case covers and straps as well. 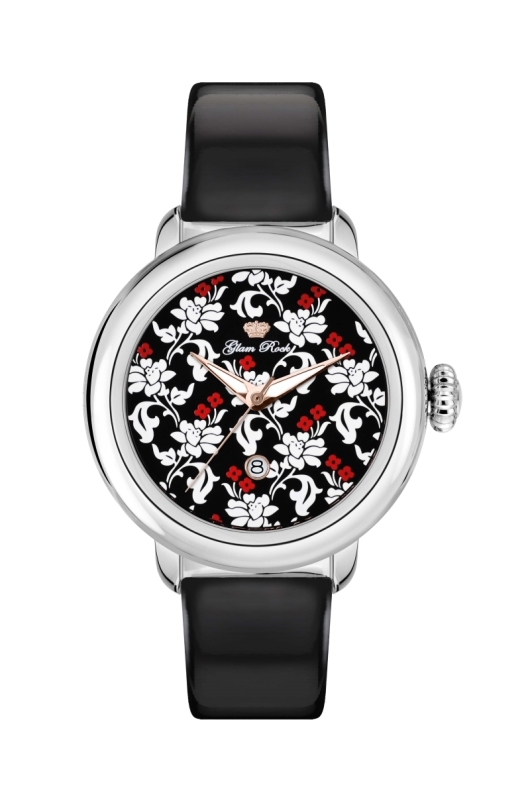 All of these qualities and material combinations allow for the spirited and progressive looks of the watches. Since the defining characteristics of the brand are sparkle and glamour, all models can be ornamented with diamonds for a truly glitzy touch. While all the diverse collections are striking in their unique way, they all incorporate luminescent hands and time graphics to provide visibility in low light conditions. Additionally, as another sumptuous detail, the crowns and pushers are embellished with a cabochon or matte epoxy layer. A cosmopolitan enclave, Bal Harbour, Florida attracts people from all around the globe with its beautiful beaches and sun-drenched weather. 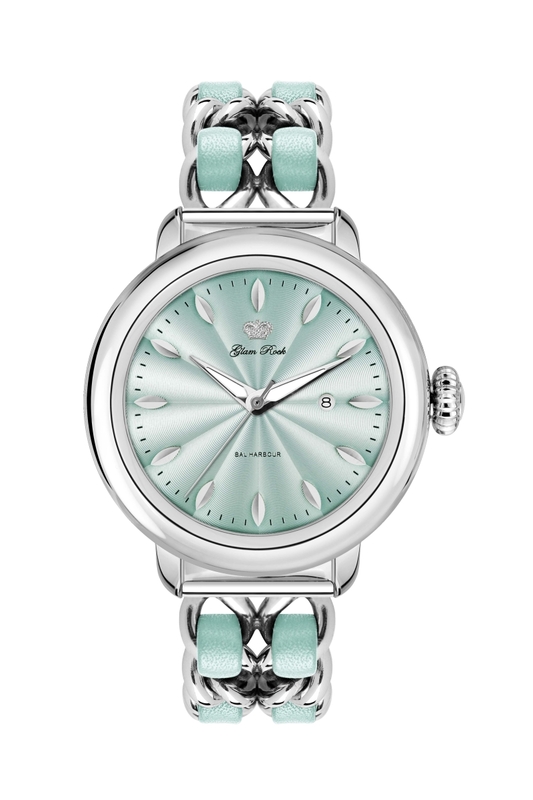 Like its namesake city, the Bal Harbour collection offers many looks. Encased in 40 mm stainless steel, the watches feature glamorous dial configurations ranging from those that are two-handed time only to a smart looking chronograph option. 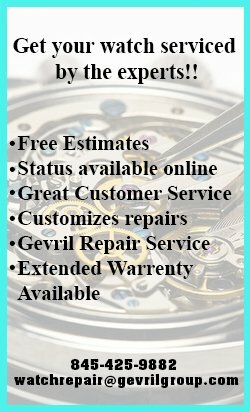 The dial designs are very artistic. While some pop with vibrant color, others take a more tone on tone approach. Choose from dials with 3D flower appliques or those with twinkly diamonds. Glam Rock plays with the artistic looks of the Bal Harbour collection by their choice of case colors that have a tortoise look application on the back. Cases come in stainless steel, stainless steel with an IP gold coating and the hot two-tone trend of gold and silver. Further enhancing the glam portrait are the iconic fashion details such as the double chain link bracelets with weaved leather or perforated leather bands with flower designs. Think Greta Garbo and Audrey Hepburn and you’ll get the feel of the elegance of the Vintage Glam collection. 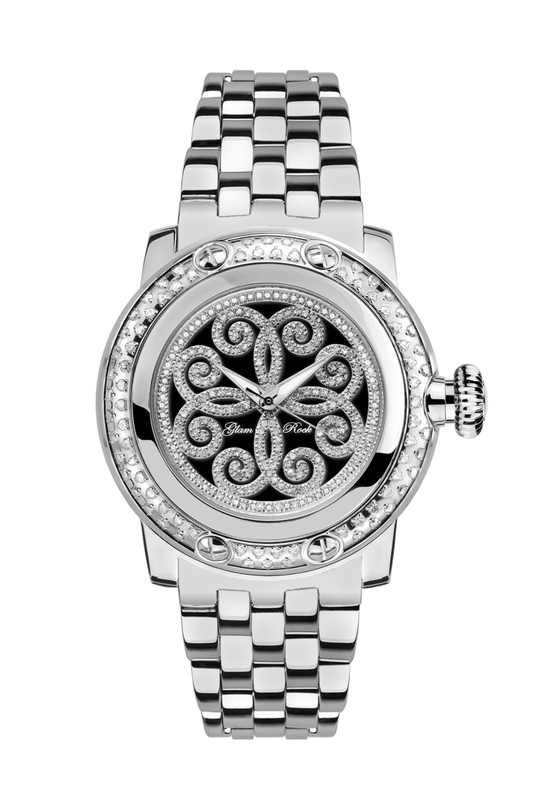 It combines both a timeless yet modern sensibility that will be the star of any wrist. 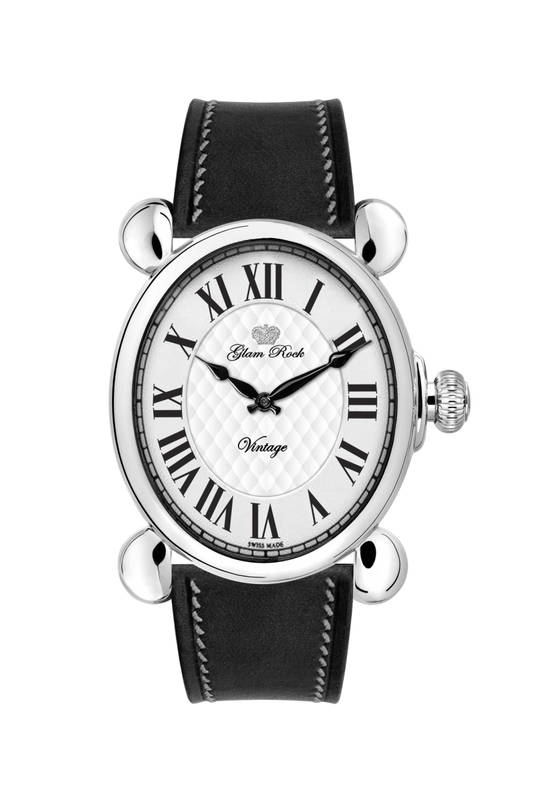 In three different shapes and sizes, they all possess sensuous lines and incorporate large teardrop lugs that frame the case, giving the Vintage Glam watches a retro look. 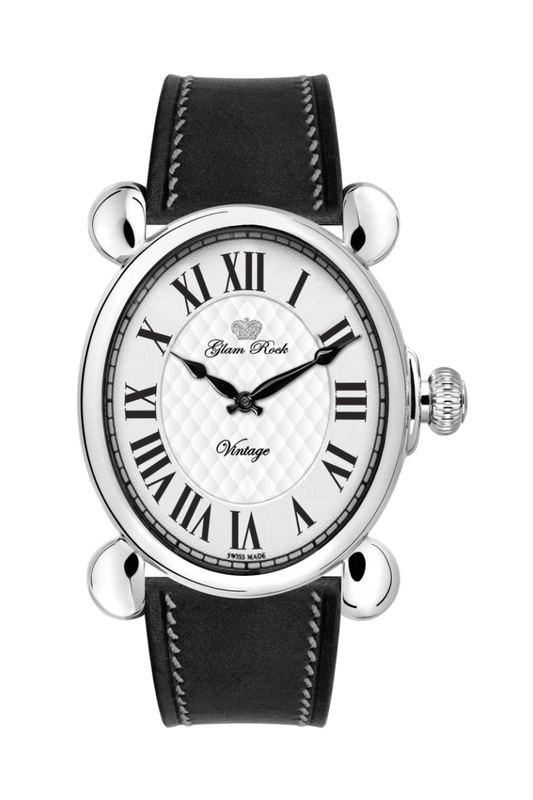 The large onion crowns add contemporary spice to the case silhouette. 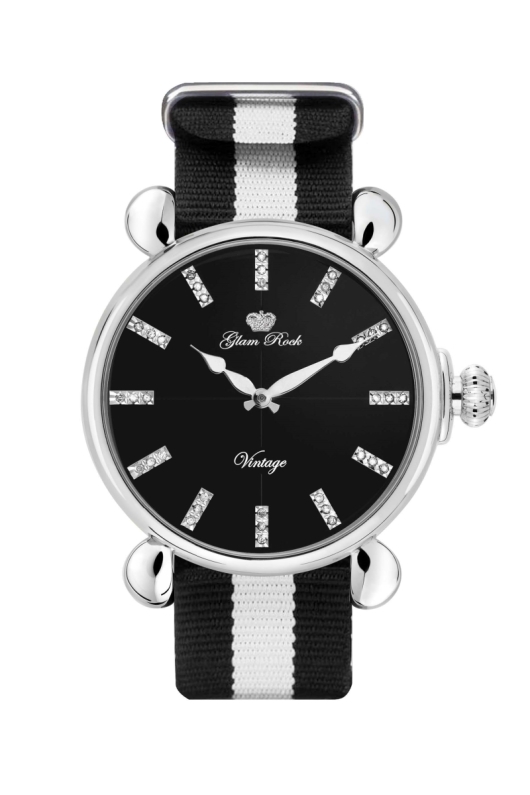 Some examples of the Vintage Glam include the 34 mm (the smallest in the collection) stainless steel round case featuring a 3D dot metallic dial dotted with diamonds paired with a black saffiano black leather strap. 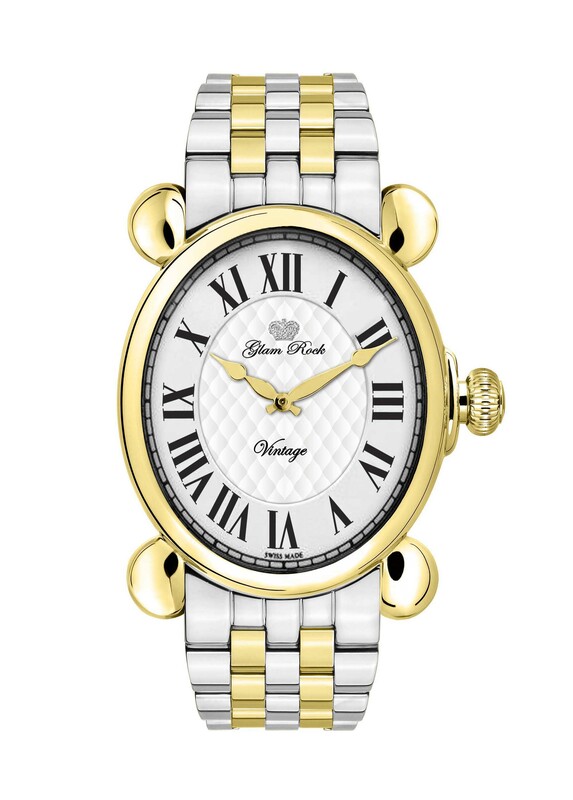 Another is the oval shaped IP gold case that comes in at a nicely feminine 27 mm x 33 mm, which surrounds an enamel dial with black Roman numerals and is fitted with a diamond encrusted bezel. 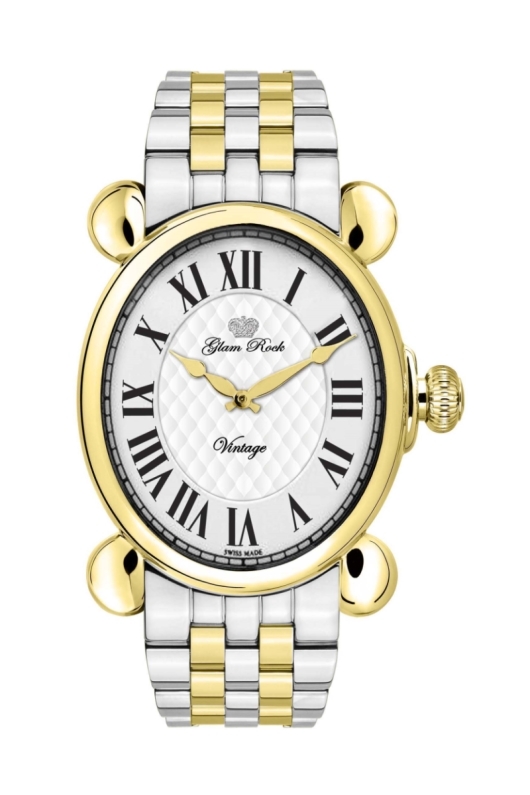 The largest watch sits in a bold 40 mm round IP gold stainless steel case. 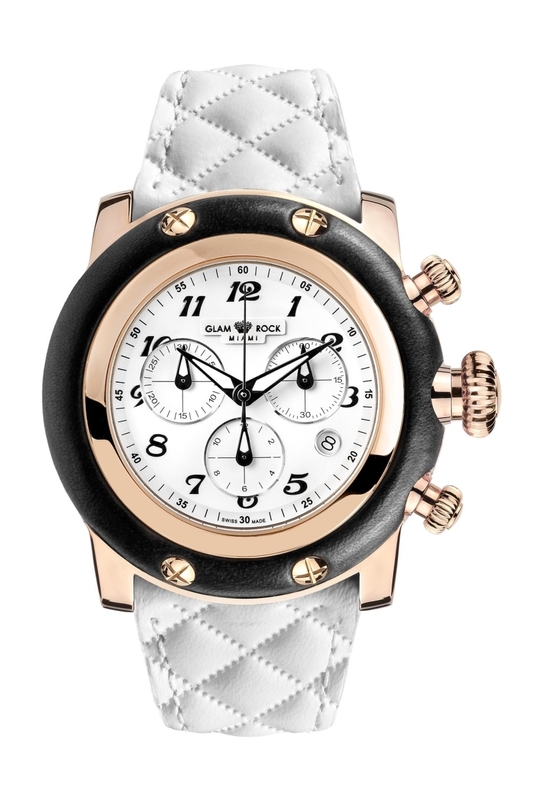 In white enamel, the dial adds dimension with a 3D application and is finished off with a white technosilk strap. Composed mostly of chronographs, the Miami collection takes a sporty complication and dresses it up in more sophisticated clothing. The chronograph was originally developed as a timing instrument for racing and science and thus didn’t have much pizazz. 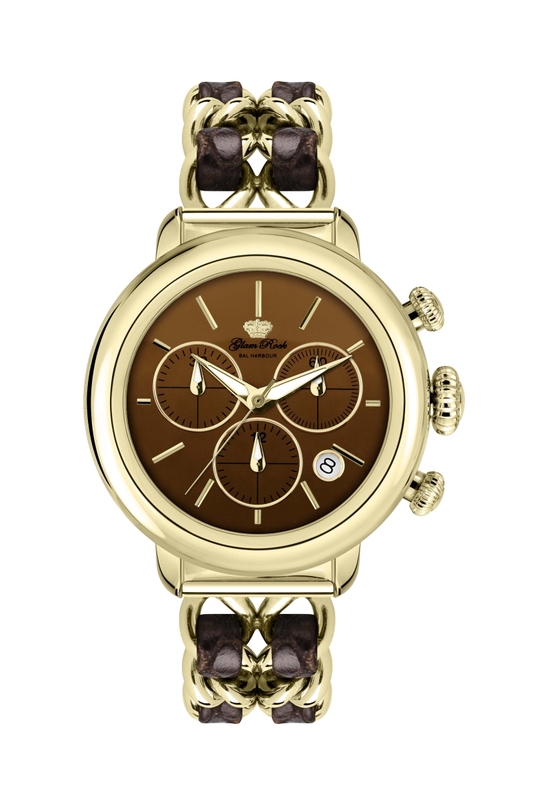 The Miami collection remedies the utilitarian look of the chronograph and gives it many fashionable facelifts. There’s no question these models will make a statement in their bold 46 mm sized case. As in the other collections, the Miami makes use of stainless steel, IP gold stainless steel and two-tone cases. They come in black, white (some of which are enamel) and diamond dials with Arabic or Roman numerals and have names like Python, Matelasse and Mirror, which express the aesthetic. What’s a lot of fun about the Miami collection is the mix and match possibilities, putting together different straps and bezel combinations for a personalized timepiece accessory. Glam Rock caters to a demanding clientele that expects creative timepieces to suit their various moods and they follow through, coming up with innovative designs that incorporate quality materials that are also on trend. 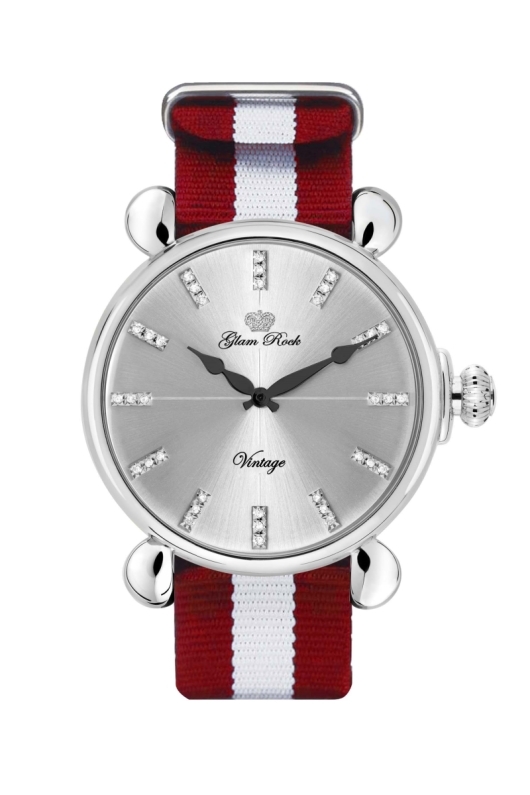 And, all of Glam Rock’s luxurious watches are Swiss made. It’s no wonder that celebrities including Jamie Foxx, LeBron James, Fergie, Britney Spears and Nicole Scherzinger have chosen to wear a Glam Rock timepiece around their wrist. 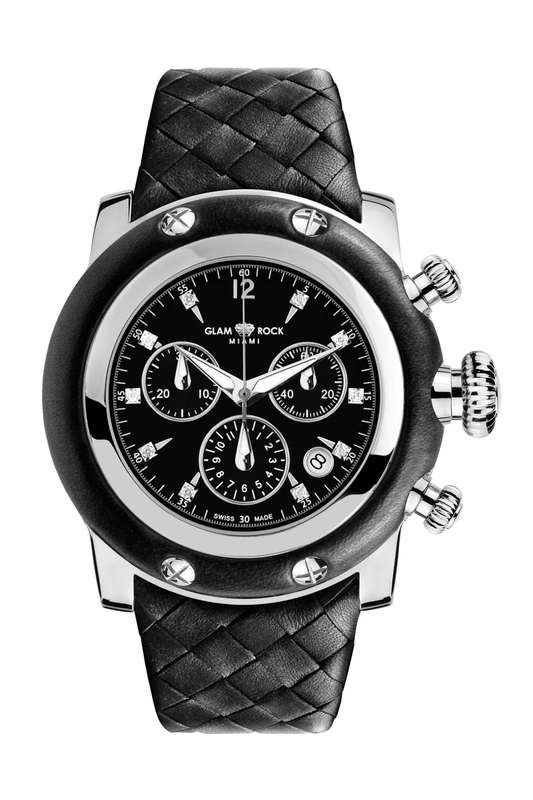 Purchase your Glam Rock watch from an authorized Glam Rock dealer.